Who would have thought that Belmont University of Nashville, Tennessee, would apply the Islamic law to its staff? But just that happened earlier this month. 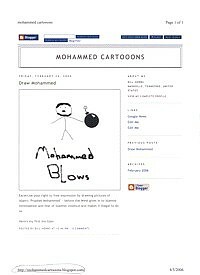 a bizzare page with the heading Draw Mohammed that spotlights a stick drawing of the Prophet Mohammed holding a bomb. The cartoon is entitled "Mohammend Blows." Under the cartoon Hobbs issues an invite to "exercise your right to free expression by drawing pictures of Islam's Prophet Mohammed". He ends the post with the phrase "Here's my first mo-toon." All this was posted at 12:40 pm, on Friday, February 24, 2006. I live in America, and am blessed to have the First Amendment, and am angry that the American media is too cowardly in the face of Islamofacists to run the cartoons. I posted that cartoon, and invited others to draw their own cartoons, as a way of protesting both American media cowardice and Islamist attempts to suppress free speech via threats of bombs and bullets and burning and beheading. But then I never publicized the site and, quite frankly, forgot is was up until today. P.S. I am insensitve toward religions that have a large number of adherents who are running around blowing stuff up and threatening to kill non-believers over cartoons. Yes, I plead insensitivity. I would prefer my children not grow up in a world governed by Islamofacists. On the other side, Roger Abramson, Spragens' predecessor at Nashville Scene, defended Hobbs early on April 14. Nonetheless, the damage had been done. Hobbs announced in the late morning at NashvilleFiles.com, "I am resigning from Belmont University in an amicable and mutual parting of the ways, effective Monday[, April 17]." A week later, the university has let calls from the press asking for more information go unreturned and has made no statement about Hobbs' resignation. Its silence attracted notice in the blogosphere (for example, from Hugh Hewitt) but still not a word was forthcoming. Belmont's action here—assuming this was a forced resignation, and I think everyone believes it is—is cowardly. I mean, Hobbs' political views haven't been a secret. Why is the school suddenly putting stock in what we have to say about one action by one individual? The school shouldn't sacrifice him just because we happen to think that something he did was pretty tacky. "Pretty tacky" is putting it mildly; Belmont's actions have real consequences. Like the Danish corporation Arla Foods denouncing the cartoons or the Swedish foreign minister forcing the cartoons off a website, this firing in Tennessee amounts to a capitulation to Islamic law. Each surrender means the Shari‘a will move inexorably forward. Related Topics: Academia, Islamic law (Shari'a), Muslims in the United States | Daniel Pipes receive the latest by email: subscribe to the free mef mailing list This text may be reposted or forwarded so long as it is presented as an integral whole with complete and accurate information provided about its author, date, place of publication, and original URL.